Nevada is a key location for viewing ancient Native American rock art in the form of petroglyphs and pictographs, much of it thousands of years old. Some of the most significant and well - preserved sites in Nevada are in easily - accessible areas. Other important rock art sites are found throughout the southwestern United States. The dry desert climate and sparse population in Nevada have been big factors in preserving these remnants of prehistoric life in the Great Basin. In both northern and southern, there are many rock art sites that are open to the public. When visiting rock art sites, maintain a respectful distance and do not climb on or touch the art. It may look durable, but even the oil from your fingers can alter what has lasted for thousands of years. Binoculars can give you a close-up look, and telephoto lenses can do the same for pictures. Rock art sites are priceless cultural artifacts and are protected by law. What is Native American Rock Art? Rock art is found in two basic forms - petroglyphs and pictographs. The distinction comes from the techniques used to produce each type. Petroglyphs are made by removing bits of rock from a surface. The artist might have pecked, scratched, or scraped the outer layer to produce the pattern. Petroglyphs tend to stand out because they were made on rock surfaces darkened by patination, the natural surface darkening that occurs with age (also referred to as "desert varnish"). Over time, petroglyphs tend to become less visible because the patina forms again on the newly - exposed rock surfaces. Pictographs are "painted" on rock surfaces using a variety of pigment materials, such as ocher, gypsum, and charcoal. Some pictographs were made with organic materials like blood and the sap of plants. Techniques for applying the pigments include fingers, hands, and perhaps sticks made to work like brushes by fraying the ends. Archaeological dating methods have been used to determine the age of organic material in petroglyphs, though few studies of that type have been done in Nevada. What does rock art mean? The short answer is that no one really knows. Many theories have been put forth, from symbols invoking religious power to attempts at ensuring a successful hunt. Until someone comes up with a way to crack the code, it will remain a mystery of the past. Grimes Point Archaeological Area is probably the most easily visited rock art site in northern Nevada. It is located right next to U.S. Highway 50, about seven miles east of Fallon. There is a paved parking area, picnic tables with shelters, restroom facilities, and interpretive signs. A self - guided trail leads you through an area with a large number of petroglyphs. Signs along the way explain some of the rock art you'll see. In 1978, this pathway was named Nevada's first National Recreation Trail. The Hidden Cave Archaeological Area is a short drive from Grimes Point on a good gravel road. Visitors can hike an interpretive trail, but access to the cave itself is closed to the public because it is a sensitive archaeological site where excavation and research is ongoing. Free guided tours are available on the second and fourth Saturday of each month. Tours begin at 9:30 a.m. at the Churchill County Museum, 1050 S. Maine Street in Fallon. Following a video about Hidden Cave, a BLM guide takes a caravan out to the cave site. The tour is free and reservations are not required. Call (775) 423-3677 for more information. Lagomarsino Canyon is one of the largest rock art sites in Nevada, encompassing over 2,000 petroglyph panels. The significance of the site is underscored by being on the National Register of Historic Places. Lagomarsino Canyon is an area of extensive study into the history of Great Basin rock art. Documentation, restoration (graffiti removal), and protection of the site were undertaken by the Nevada Rock Art Foundation, Storey County, the Nevada State Museum, and other agencies. Much has been written about the petroglyphs of Lagomarsino Canyon and the story they tell of the prehistoric human occupants of the Great Basin. For those interested in more detailed information, ​Nevada Rock Art Foundation Public Education Series No. 1 and Lagomarsino Canyon Petroglyph Site from the Bradshaw Foundation are excellent sources. Lagomarsino Canyon is located in the Virginia Range, east of Reno / Sparks and north of Virginia City. It is surprisingly close to populated areas, yet still fairly difficult to reach on rough backcountry roads. Southern Nevada has numerous rock art sites. One of the best known and easily accessible is in Valley of Fire State Park, about 50 miles east of Las Vegas. Valley of Fire is Nevada's oldest and largest state park. The main petroglyph site within the park is at Atlatl Rock. 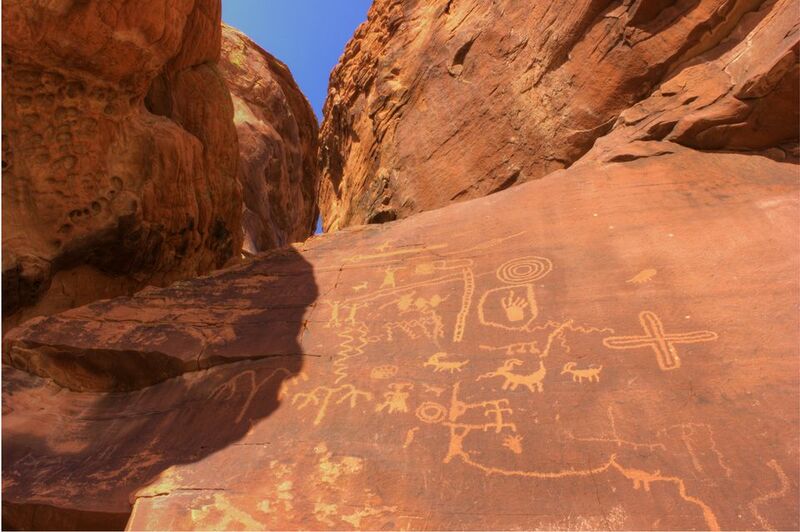 These well - preserved petroglyphs are high on the side of some of the park's signature red rocks. A ladder and platform have been put in place so visitors can get a close view of (but not touch) these pieces of ancient art. Red Rock Canyon National Conservation Area is at the west edge of Las Vegas and is Nevada's first National Conservation Area (NCA). Within the NCA is archaeological evidence of thousands of years of human habitation, including several locations where rock art is found. When you visit Red Rock Canyon, stop at the visitor center to learn more about viewing rock art and other recreational opportunities. Sloan Canyon National Conservation Area is also in southern Nevada near Las Vegas. Within this NCA is Sloan Canyon Petroglyph Site, one of Nevada's most significant petroglyph sites. Sloan Canyon contains a designated wilderness area and is not nearly as easily visited as Red Rock Canyon. Be prepared for rough roads and backcountry travel if you go. Check out the directions from the BLM before heading out. Nevada Rock Art Foundation and Southern Nevada Rock Art Association are great organizations in Nevada that can help you learn more about this fascinating subject.